A wig-tastic rival schools chopsocky from the Godfrey Ho school of crazy. Two masters duke it out on a beach, the conclusion of which sees Master Chu – a Crane style practitioner – getting his leg smashed by Master Wai, a Snake Fist exponent. Fast forward 20 years and the conflict has extended to the next generation. Chu’s boy waves around two red footballs and sticks pins in his opponent’s pressure points, as he and his sister (Yuen Qiu) lead the charge in taking down the Snake Fist school. Dragon Lee plays Master Chu’s star pupil who settles in the suburbs with his new wife and father in law. 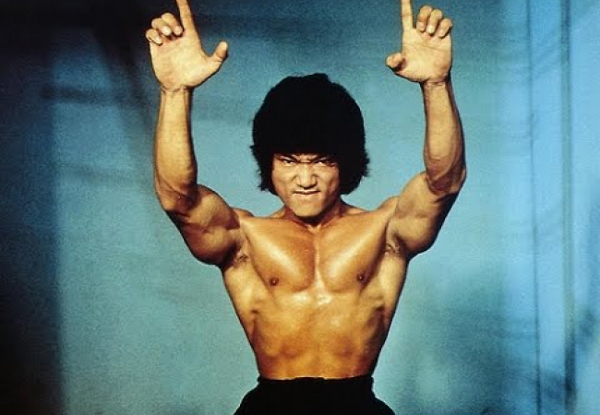 He sets up his own kung fu school with a philosophy built on humility. That’s until he’s forced to abandon his missionary work and kill a load of people. The final act includes a number of typically eccentric Godfrey Ho inventions, like Invincible Tiger (played by Ho regular, Bruce Lai), a master of a silver hoop technique who is upstaged by his own mustache. There is also a kung fu fire breather thrown in for added nuttiness. This isn’t quite up there with Ho’s best Dragon Lee work (see The Dragon, the Hero), but it’s fun nonetheless. 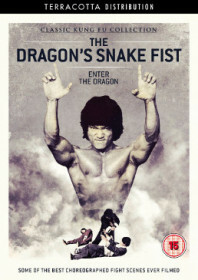 The Dragon’s Snake Fist is available to buy on UK DVD from Terracotta Distribution as part of their Classic Kung Fu Collection.